It is possible to choose which binding should be used when firing a transition. This is done by using the bind manually tool or clicking on the green triangle in the lower left corner of an enabled transition. This will open a binding index showing the variables and the values they can be bound to. A ? after a variable indicates that no value has been chosen for that variable. The binding index will then change, removing all the values that are no longer possible. To fire the transition with this binding use the single step tool or if all variables have been bound, just click on the binding index. 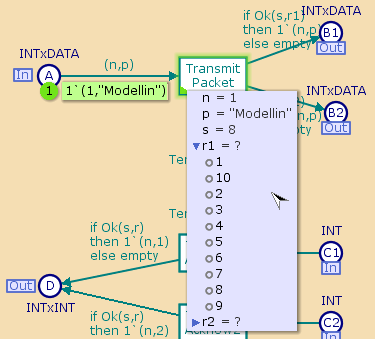 It is possible to partially bind a transition. A value will then be chosen for the variables that are not bound when the transition is fired. After firing the binding index changes background color and shows the binding that was used. To close the binding index after firing simply click on it. It is possible to abort manual binding using a marking menu on the binding index. Manual binding will also be aborted if any operation communicating with the simulator is performed. 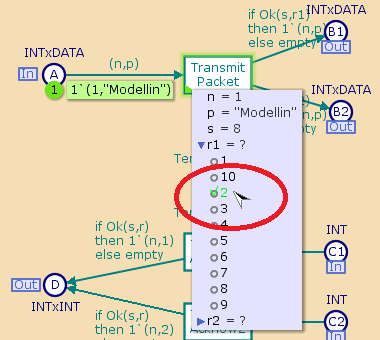 It is possible to move the binding index to another position. The position will be saved when you save a model.